Map showing the compliance with the Common Fisheries Policy of the EU, for 357 stocks in 12 ecoregions, for the last years (2013-2015) with available data (excluding 40 wide-ranging stocks). See the report for more details. SEEC researcher Henning Winker helped develop the Oceana report that suggests that if exploitation followed scientific advice, sustainable catches in EU waters could reach more than 3-fold increases in stocks like sardine in the Cantabrian Sea or cod and haddock in the North Sea. Brussels, 14 November.- Fish catches in EU waters could increase by 57% if fish stocks were exploited sustainably and based on scientific advice, according to new research released by Oceana today. The study was led by renowned fisheries expert Dr. Rainer Froese at the GEOMAR Helmholtz Centre for Ocean Research in Kiel in Germany and provides the most comprehensive overview so far of overfishing in European fish stocks, analysing 397 stocks compared to around 150 monitored by the European Commission. The potential recovery of fish stocks following sustainable management measures would mean more fish in the sea resulting in increased catches obtained with less fishing effort and less impact on the ecosystem. 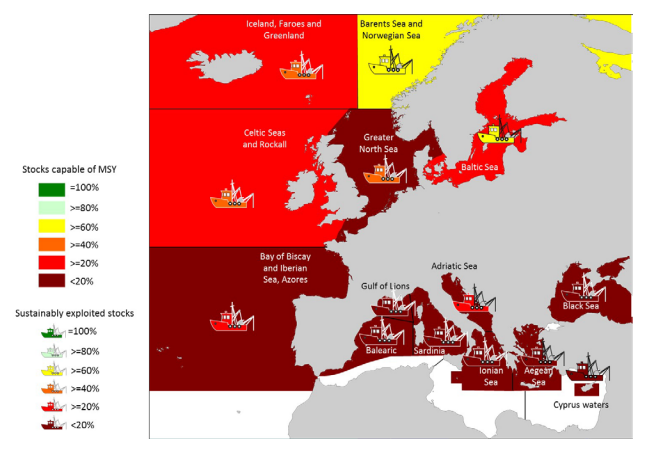 Among the stocks that would benefit most from proper management, scientists calculate a potential increase of catches of over 300% for haddock and cod in the North Sea, some herring stocks in the Celtic Seas, and sardine in the Cantabrian Sea. "We used an advanced implementation of a standard stock assessment method to obtain estimates of status and exploitation for nearly 400 fish stocks in European Seas. For the first time, all European stocks have been evaluated relative to the maximum sustainable yield they can produce, as required by the new Common Fisheries Policy. Our results show that catches can be substantially increased if stocks are rebuilt and properly managed", explained Dr. Rainer Froese, senior scientist at GEOMAR. The results of the research were revealed one month before a final decision for 2017 fishing limits in the North East Atlantic which will be negotiated between the EC and the 28 respective fisheries ministers during a meeting of the Council of the EU on 12th-13th December in Brussels. Oceana reminds EU decision makers to give up the current short-term approach and urges urgent action to put an end to overfishing in European fisheries to achieve the legal requirement of recovering all fish stocks above healthy levels by 2020.